But, our team is made up of beloved data and engineering geeks in the same way we have our insurance gurus. We’re all focused on reinventing insurance by using technology to recognize and reward the choices you make on a daily basis. With smartphones in everyone’s pocket, HiRoad works for a lot of different people, but the early adopters of the world quickly see the value and why it makes sense for them. So, we wanted to peel back the curtain and tell you a little more about the technology we use. 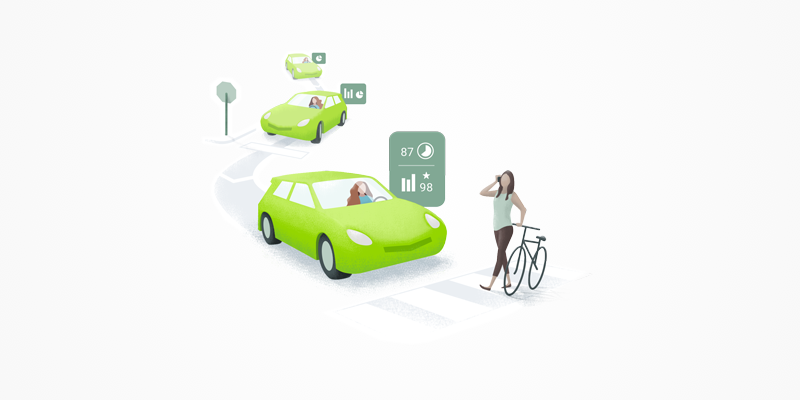 Using your smartphone’s accelerometer, gyroscope, and GPS, and our data science, we can recognize and reward your good driving, and give you a monthly price based on how you drive everyday. Just as wearables showed us that steps were worth counting, we show you that your driving is worth recognizing. Ultimately, we aim to lead to a better world creating safer commutes and communities in the process. None of this is possible without the technology that’s behind it. So, let’s dig in there. Accelerometer — a tiny chip that senses change in velocity (also used to auto-rotate your screen from portrait to landscape mode). This is how your phone can count steps, or sense your gas and braking in a car. Gyroscope sensor — by recognizing rotational forces, it works in tandem with the accelerometer to understand motion and how your phone is oriented (for example, tilting your phone or game controller to steer in a racing game). Working together, these three sensors give precise data on how you drive, which helps us recognize your smart driving. It’s all already in your phone, and you’re probably already using them every day, so we figured, why not use them to reward you? This is all a part of the larger field of telematics, which includes telecommunications, vehicle technologies, road transportation, road safety, computer science and more. As computers continued to shrink and technology was invented to connect them, telematics was born. Today the word “telematics” is most closely associated with vehicle telematics. The field will continue to expand more as innovators find new ways to use GPS units, low-power mesh networks, processing power and the broad use of mobile devices. We mix it all together. We consider how much you drive, your braking, accelerating, cornering, and other driving variables through our algorithms, so what you pay is based on how you actually drive. All of this together helps us determine your monthly bill. We play back your driving information to you in the app so you can see what’s going into your price and where you could increase your monthly rewards. Each month you have the chance to improve your price based on smart driving. With this technology, we also learn about a lot of other things like vehicle mileage, road types, driving patterns, and more. As we look forward, we’re aiming to offer you personalized tips (based on your driving) so you can maximize your mindful driving and savings. It’s all part of a bigger plan—we believe you should be rewarded for taking the high road when you’re behind the wheel. For us tech geeks, those of us that want car insurance that fits into our modern tech-fueled lives, it’s a fit.